The fear is not unfounded: Nearly one in 10 planners already has had bedbugs affect a meeting, according to the 208 respondents to a recent M&C Research poll. Fully 87 percent are extremely or somewhat concerned about the latest scourge to hit hotels and venues (and the media). For 42 percent, site visits now include a visual inspection for evidence of bedbugs, and 29 percent have begun to routinely ask properties whether they're prepared to ward off a potential infestation. 9% have dealt with bedbug infestations at their meetings. 9% have personally experienced the pests in their own travels. for reports of bedbugs at specific properties. 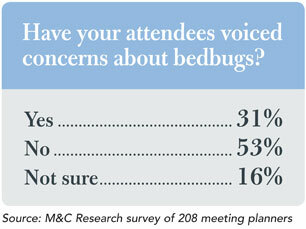 13% are not at all concerned about the possibility of bedbugs at meeting hotels or venues.